Tlazolteotl is an Aztec Goddess associated with numerous meanings, including birth, fertility, midwives, purification and also filth. As a purification goddess, she was seen in Aztec culture as a cleanser of filth and disease. However, as is shown in this sculpture, the goddess is associated with birth. 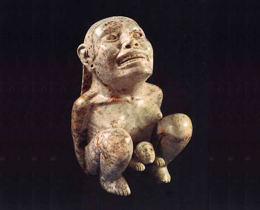 Furthermore, her symbolic and iconographic connections to birth appear to have grown over time, as one today finds replica Mexican sculptures of the birthing goddess for sale, some of which are used by pregnant women in preparation for birth. 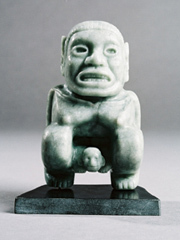 In this figurine of Tlazolteotl, the goddess is shown with her buttocks down and in the squatting position of birth, the full head and arms of her baby emerging from between her thighs. In many cultures, this position is often favored by birthing women. Gravity aids the woman, as does the positioning of her hips, which are slightly elevated and spread out. In the case of an unassisted birth, the mother can easily receive her baby by herself while in this position. Hi there, some of them are definitely mass produced but there could be others that are more rare. What does yours look like and is it a Tlazolteotl figurine or an image of a different figure?